The best discoveries often take time to find which makes searching for them all the more fun (and frustrating too, but we soon forget that evanescent feeling when we lay our eyes upon the prize – it is absolutely worth it). It was by pure accident that I wandered into the square of Vaison-la-Romaine on Sunday (last Sunday), my first full day in the village before beginning my cooking class with Patricia Wells. The copper gleamed in the Provence sun, and the cut glass shimmered. What is brocante? Well, if you follow Sharon Santoni, you are quite knowledgeable on this topic, but even I, since I had never been to one, wasn’t quite sure. 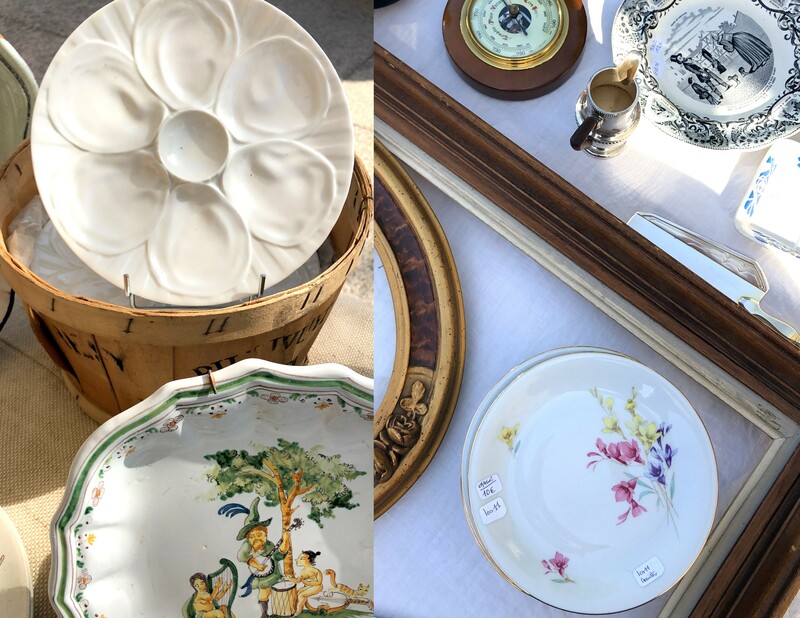 In essence, here in the states, we call them flea markets, but having been to flea markets in the states, there is a difference between French and American versions. To be fair however, there are steals, gems, junk and gorgeous antiques to be discovered at both. 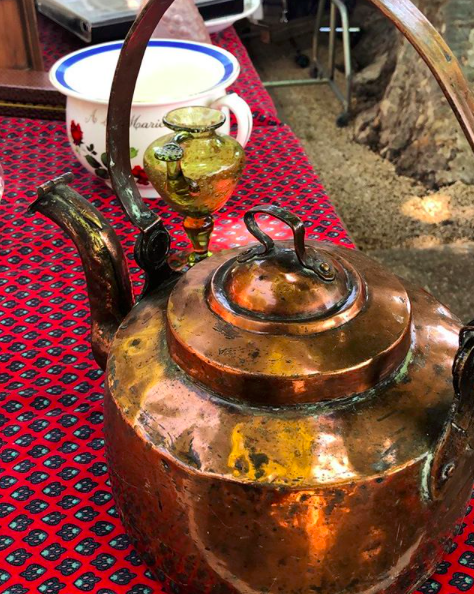 Moseying about the square, as I shared on Instagram, I came upon this beautiful, patina (well loved and used) copper tea kettle (see below). The picture doesn’t offer proportions well, but it is a grand size. I knew I wanted it, but wasn’t sure of the price or if it was functional. I asked – 40 Euros. Functional? Yes. I peeked inside. It looked okay (perhaps a retinning down the road). I left and came back and haggled a bit to buy it for 35 Euros. I was hooked . . . on brocante. Now to find another suitcase to bring my treasures home. My second brocante experience was grand. Why? It was recommended immediately by Patricia Wells herself whose home of Chanteduc demonstrates her and Walter’s talented eye for finding unique, yet functional dishes, decor and details for their home. Where to go, I asked, as I shared with her I was heading near Gordes for my next leg of my trip. L’Isle Sur la Sorgue brocante market on Sundays (8-4, most artistans are fully set up by 9 – get there early). There was no hesitation in her voice. It was settled. I knew what my plans would be for Sunday morning. And she was right AND she was there (to lend credibility to her recommendation). Let me explain. 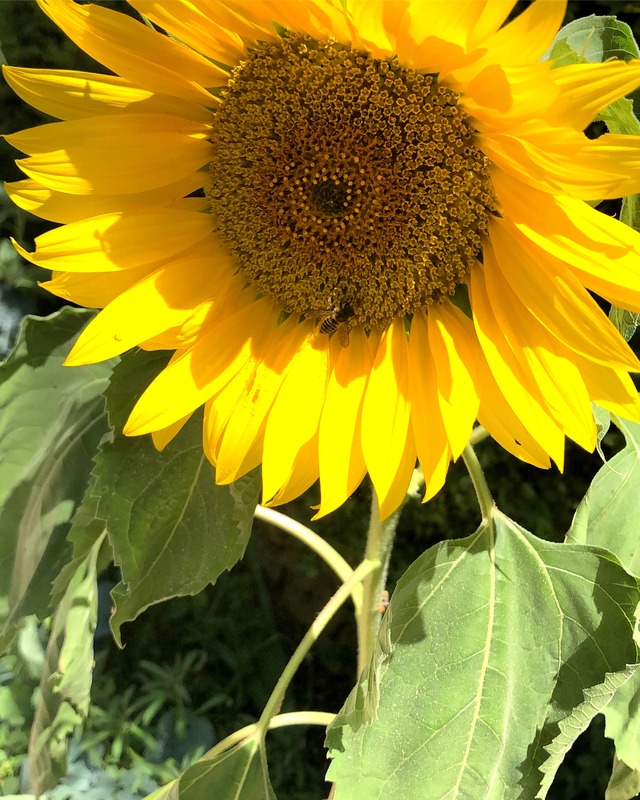 I arrived early after a beautiful morning drive passing, vineyards, and sunflower and lavender fields along the country roads. However, I couldn’t initially find the brocante part of the market as it wasn’t within the food booths. I hopped in my car thinking maybe I had misunderstood. 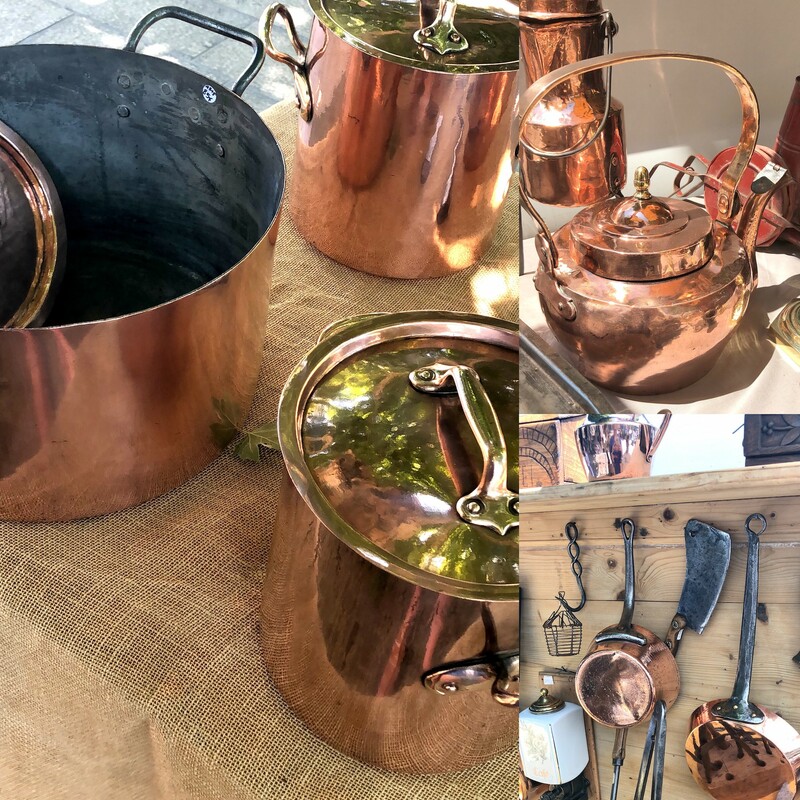 I began to drive out of town along the main street, and then I saw it, all of the brocante booths full of kitchenwares, furniture and weathered and improved-with-time items. And then I saw a familiar face – it was Patricia Wells! And that moment, I knew I had found the brocante she had recommended. I quickly parked my car again (it was half past nine), as the crowds were growing quickly (it is the largest market in the region on Sundays – a can’t miss). Visiting another country on your own you expect to not recognize anyone you know, and perhaps only barely speak your native language with those you run into. This experience was different as I ran into Walter and Patricia Wells discovering a treasure of their own and had a lovely chat of appreciation for many things before going on my way. To run into someone who knows your name, let alone it being Patricia Wells – was priceless and most memorable. She recommended a few booths she had come across offering beautiful white dishes (the oyster dish she specifically talked about – seen below), and so we went along our separate ways to enjoy the market and the rest of our summers. My treasures were few, and not too large, but they are special. Below you will see in the upper lefthand corner, French crystal knife rests. I explained in my IG Story video yesterday (see my French Trip 2018 highlights in IG). For each meal with Patricia, when we sat down for lunch, each setting had a knife rest. She had many different sets – I believe a different one for each meal, and since you do not see these in the states, I assumed they must be hard to find. 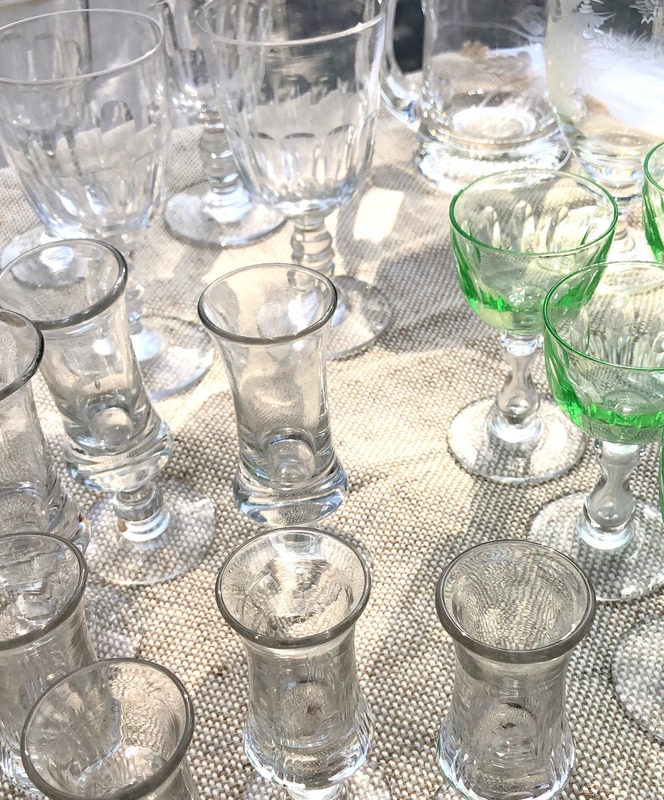 But to my delight – not if you frequent brocante markets! I came across four different sets, and three of them at one particular vendor. The number in the sets vary, but they are treasures to find. Paying 35 Euros for my set of 9, there was another beautiful set for 120 Euros (too much for me). However, it is a small detail that is thoughtful and provides more ease to the dining experience as you do not have to worry about balancing your knife on your plate while you eat. I also picked up these cloth napkins that while not extremely old sang the story of Provence to me. With a full set of 12 and a matching tablecloth, for 15 Euros, I was quite pleased. (The table setting and silverware are my current vacation rental’s – isn’t it all beautiful and full of great taste?). 2. Do a walk-through, unless . . . Similar to how I approach farmers markets, I walk through the entire market once giving myself time to contemplate what I truly need and to compare prices. However, if you find something that you know will be scooped up quickly and you are in love – haggle and bring it home on the first run-through. Whether you are buying two or more items from the vendor or just the item your eyes are feasting upon, offer a much lower price. Each time I have haggled, I have paid less than the sticker price. In France, as everyone reminds, always enter the shop, boutique or booth by saying “bonjour”. I think this is wise advice wherever we find ourselves in the world. Establishing an understanding of appreciation for their goods shows recognition and respect. They notice, and they especially notice when other shoppers have not taken the time to do this. The knife rests I purchased were immediately reduced for me without even haggling as other shoppers were only speaking English, did not say hello and were inquiring about the same knife rests. Sincerity of appreication and kindness pays off in the most unexpected ways. This one can be hard in the moment because each item is usually unique and not likely to be found elsewhere, but we truly do not need everything we love – at least not all at once. We want to savor what we truly know we could use well in our lives, and if we buy too much all at once, some items won’t be as loved as others (and, let’s be honest, we probably won’t be able to pack it all and bring it home if we’re flying). Needless to say, I am certainly someone who will be looking forward to “brocanting” (I don’t believe that word actually exists, but I like it, so I will use and I know you know what I mean ;)) as I begin to finally turn my attention to my own home’s decor (even though it is a rental). 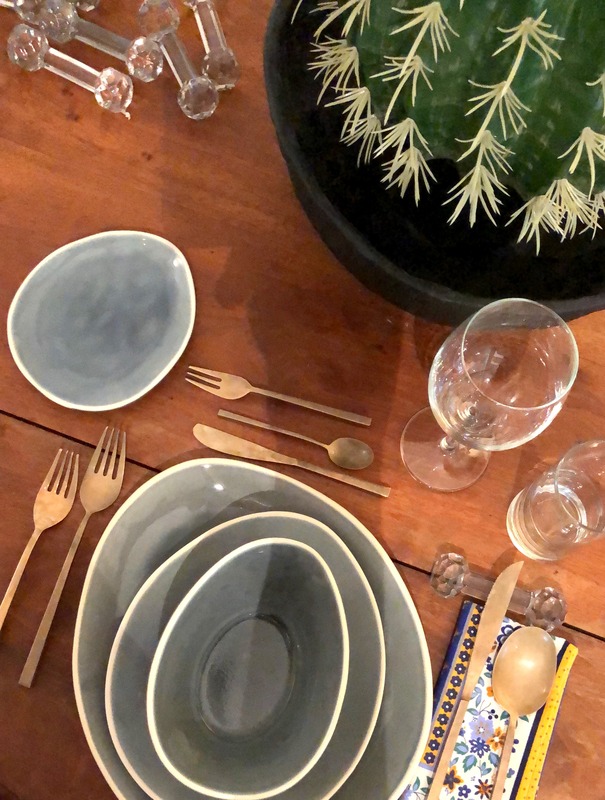 From online opportunities found at Rabbit Hill Farm to garnering endless inspiration from Sharon Santoni and her French Country Home (she hosts Brocante tours as well if you are traveling to France! ), wherever you live, enjoy the hunt, the outing and the people you meet along the way. ~Since we’re talking about bargains, while I won’t be in the states for the Fourth of July, I still wanted to take a moment to bring your attention to sales in the states. Save an extra 25% off sale items – clothing, home, jewelry, beauty and wellness. A few picks below. Take 10% any full priced item with promo code LA8L and sale items marked up to 50% off the regular price. Up to 50% off summer clearance. So many desks on sale – I especially am dawn to this Raba Sawhorse-Style desk (check out the legs) and for a modern take on a copper kettle (at a great price), this is quite fetching. Up to 70% off (an extra 15% off certain items with promo code SUMMER15). Save 25% off Summer Essentials (everything found at this link). A few picks below. Brocantes can be quite confusing. There are open-air flea markets that set up, often on Sundays, in a square or parking lot. Then there are brocantes that are physical shops, a cross between antique and junk shops, with vintage thrown in. Cheaper than outright antique stores. Then there are vide greniers (empty the attics), which are like mass garage sales, since private garage sales aren’t allowed. 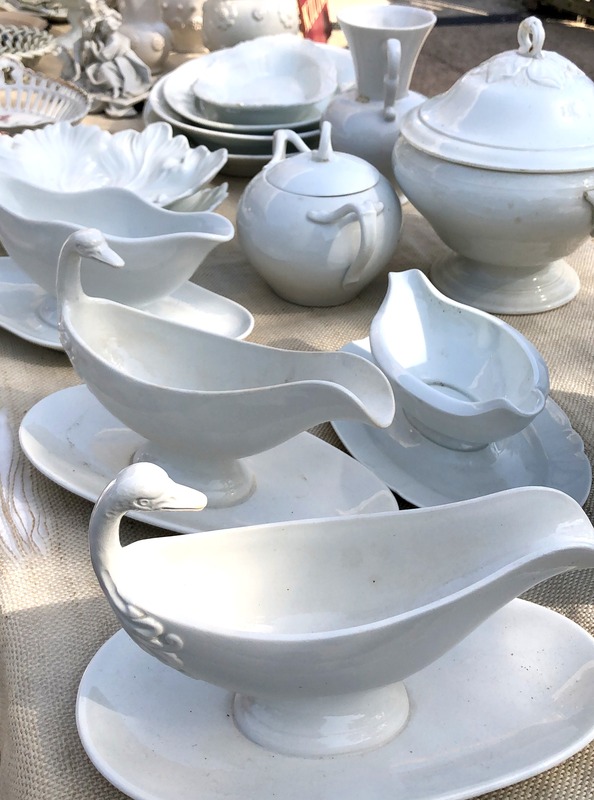 You get the best bargains at the vide grenier–it’s where brocante sellers and antique shop owners get their stuff–but you have to wade through lots of real junk. Still, they are an incredible window on private lives. I’ve seen some very clever knife rests, including some shaped like weiner dogs. Another so-French thing: coffee spoons, which are smaller than regular teaspoons. I found some with grape clusters on the end. 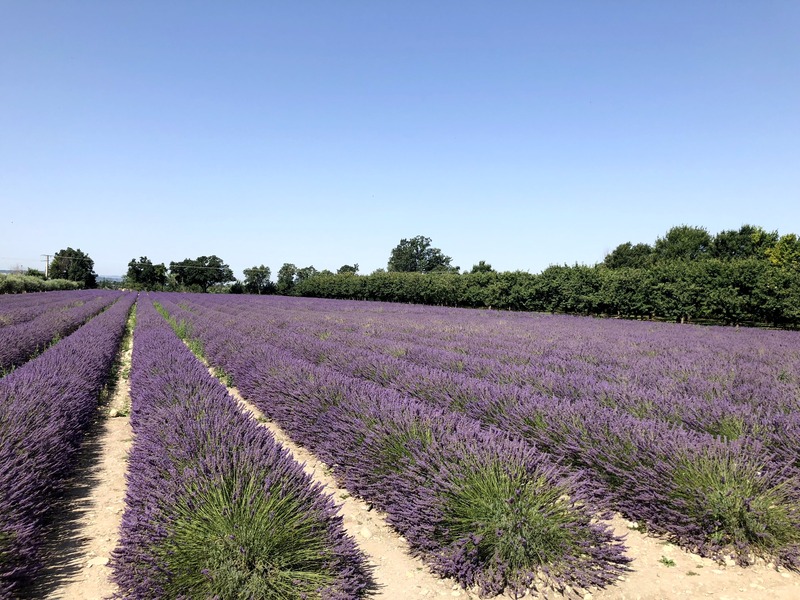 I just love reading about your once-in-a-lifetime trip to Provence. I love the French Brocantes. I usually purchase lovely lace trimmed Shams or table linens because of their packability. Yourteapot is the perfect treasure. It will make a wonderful addition to your kitchen and what a treat to go to the Patricia Wells cooking school. I would love to do this, but I am getting a new roof and gutters, so no travels until spring. A new roof and gutters sounds like a very wise and savvy idea. 😉 You are absolutely correct, the linens will be far easier to pack. I am looking forward to hitting a few more markets, perhaps a brocante as well, and am keeping my eyes open for one or two more great finds. 🙂 Thank you for sharing. Ahhhh! Sounds wonderful! Every time I’ve been to the brocantes in France I’ve had to buy an extra suitcase for the trip home. For once, Shannon, this is the time to abandon buying the best quality. (Unless you need a new suitcase anyway.) Get a cheap one and give away when you get home. And if you buy old linens you can wrap your other treasures up in them! Love seeing your pics and know you’re having a marvelous trip! I accompanied my husband on a business trip to Bend in April. I fell in love with Bend and then discovered your book at a book store there. Now I am in love with your blog. And, hey, by the way, this coming September will be our 5th September in a row spent in Provence. Syncronicity? Maybe, or perhaps just living a simply luxurious life? We have been to Vaison la Romaine, Isle sur la Sorgue, Gordes and can’t wait to see where you go next. Thank you so much for taking the time to write to all of us while you are enjoying France. Rebecca – brilliant!!! Thank you very much for sharing this idea. I can see why you return so often. It is a leisurely escape full of opportunities to relax, eat well and find treasures. Thank you for sharing the synchronicity. How lovely! Yes, I do love Roundabout Books. They have been a great supporter of my books. Thank you for picking up a copy! Isn’t Bend lovely? I do admit, I feel fortunate to be able to return to such a haven and spend the rest of my summer there.